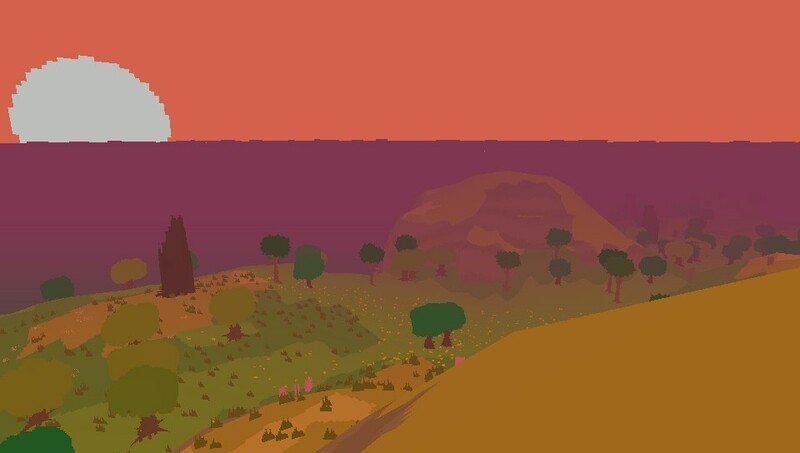 Proteus starts you on the ocean as you head to the eponymously titled island. Not knowing what to expect when I reached the sandy shore or what I was going to experience when I arrived. 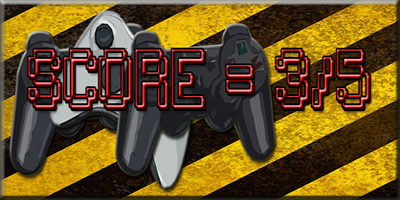 The controls will be familiar to anyone who has used a control pad to play a first person shooter, left stick allows you too move and the right stick controls your view. What I found as I walked over the beach, to a grassy area with a few sporadically placed trees, spotted a pixelated frog, which as I approached it hopped away producing a blippy-bloppy noise, so I followed it not really knowing if this was what I was meant to be doing or not. I followed this frog through dense woodland, up hills and down valleys, I realised that as I passed objects like plants some hid themselves with an audio flourish as I approached. 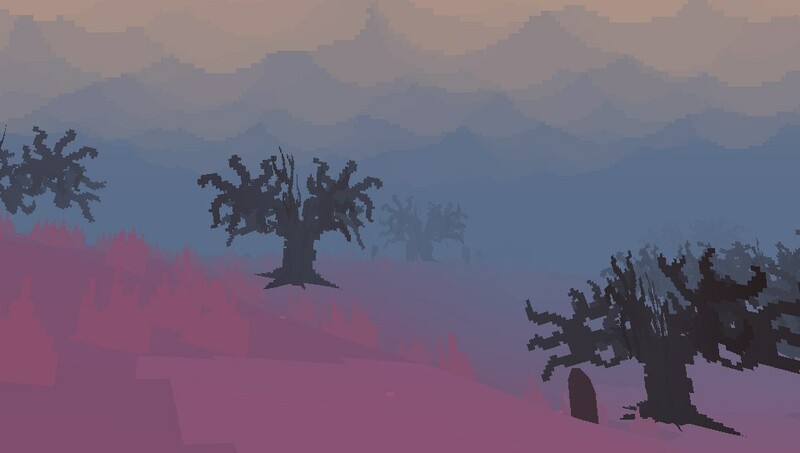 The visual style of Proteus is very odd, yet reassuringly familiar, as the blocky flora and fauna have a flat look to them until you move past them on a side and you realise these flat looking objects are actually in three dimensions. The size and scale of this little island only became apparent when I reached the top of a snow capped mountain just as the sun was setting. Taking in the vista and enjoying the suns leisurely decent, this world looks vibrant, lovely and serene, but I still had no clue as to what I was meant to be doing or why I was here. Generally games bombard you with objectives or missions, waypoint markers or enemies to engage with, Proteus doesn’t and this felt jarring to me. So I simply watched the sunset in deep contemplation from my vantage point, enjoying the moon rising and stars emerging, this altered the way the world appeared. In the distance I could see particles fall towards a central point, out curiosity I meandered down the mountain side and noticed strange looking objects coming out of the ground. These bear a strange resemblance to grave stones, following them I noticed they lead to a circle of them, where loads of particles wear dancing in the air. As I entered this strange stone circle the world became odd and twitchy. The world appeared to be running through seasonal changes at speed, when this ended I was in the same place but it now appeared to be summer. 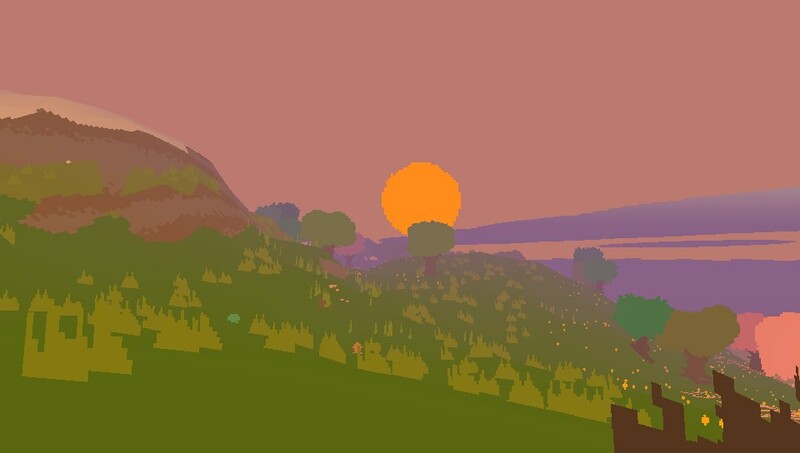 Just like changes within the real world Proteus’ became more colourful, as well as can be hit by varying weather systems. The game takes you through the remaining two seasons before ending in a bizarre conclusion that feels like it should have Aled Jones singing during it. Which upon completion I restarted my experience with an expectation of finding things I’d missed, which there are tonnes of little oddities. There’s so much detail crammed into Proteus’s world, my favourite apart from the frogs, are the owls that sit in trees during the night sections, and fly off, when you approach. Proteus features both Cross-buy and Cross-save allowing for play on either PS3 or PSVita, and looks lovely on a big screen. For me though the PSVita is perfect, especially after having a serious first person shooter session, as it’s so damn calming. 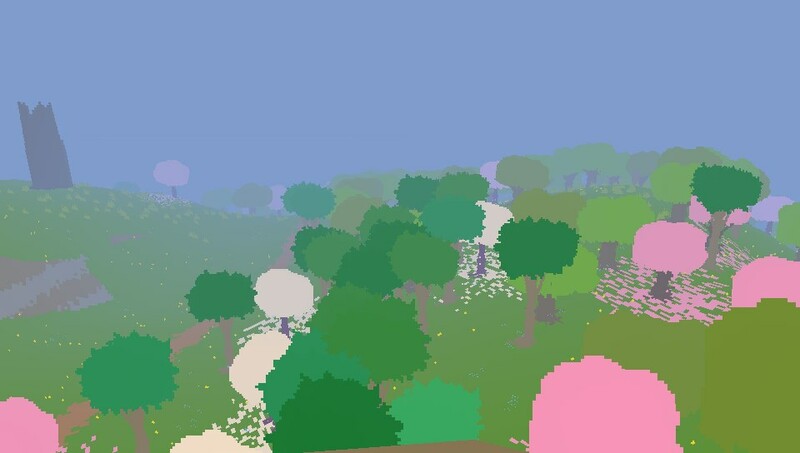 Proteus has some similarities to Flower but it’s lacking the narrative and objectives of that truly wonderful game. 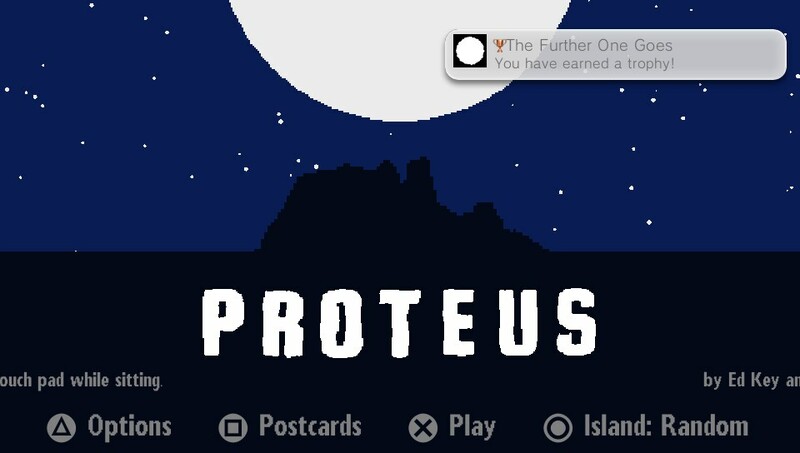 I can not say I feel Proteus is a game but, an original explorative experience, that has eleven Trophies to discover including a Gold. I do recommend the experience but don’t feel it’s essential, mainly due to it feeling like an interesting waste of time but has little in it to make you regularly return. Review copy provided by Curve Studios. Nice review was waiting to pick this up, probably wait for a sale! 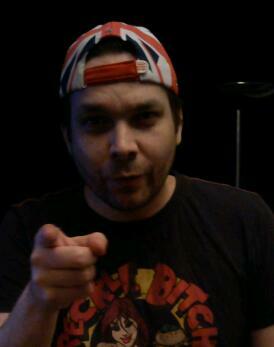 Glad you like the review, well worth picking up if you’re after a different experience from usual games.